In this article, we will cover the different types of water wells for your home, cottage or business. A water well is necessary when you require a potable water source to supply an area that isn't served by the Town or City Water Supply System, therefore the home owner is going to need their own well/pump system within the home, cottage etc that will act as the main source of water. Dug Wells. In the past and still in some uncivilized areas, dug wells are/were dug/excavated below the water table(usually by hand with pick and shovel), until the water entering through well lining/casing exceeded the required flow rate. These wells would have been lined with large and fine rock, tile, brick, etc to increase the wall strength, preventing the walls from collapsing, and to provide a basic level of water filtering. The well would then be capped with a wooden lid, and a bail and pulley system would be used to elevate the water to the surface. Today in most civilized areas, Dug Wells are excavated with heavy machinery, lined with pre-formed concrete walls and metal screening as a basic filtering system. The lid is made of concrete or metal, and a shallow well jet pump is installed to lift the water to the surface. Dug Wells are used in areas with a high water table, and areas where water can travel easily(permeable), such as clay or fine silt and sand. Note: due to Dug Wells being very close to the surface, and relying on low quality filtering within the well casing, these wells are very susceptible to ground water contamination and potential freezing in Northern Areas, and very reliant on precipitation to provide sufficient groundwater. It is highly recommended to conserve water in the dryer months of the year, and have an Ultra Violet Water Treatment System, Carbon Filter/Fine Particle Micron Filter and or possibly a Water Softener System Installed for filtering purposes. Other, more expensive systems are available as well. Do some in-depth homework before installing any well/pump system. 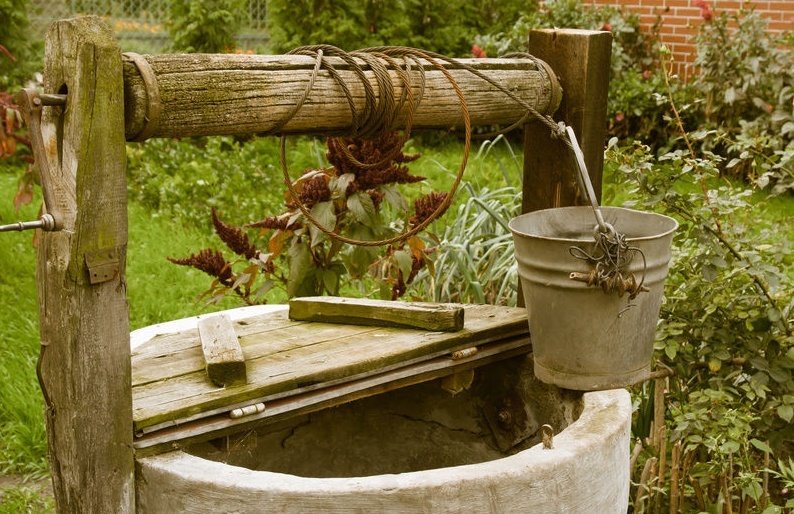 If your area has long, dry months of the year, a Dug Well system is not recommended. Bored Wells. These types of well systems are designed for areas similar to dug wells; in areas where the ground is very permeable, and the water table is relatively close to the surface. Bored wells are usually less than 100 ft deep (39 meters), 18"-36" (45-90 cm) wide, and constructed by using a Rotary Bucket Auger system. The large diameter of the Bored Well casing is a definite advantage, allowing for more surface area for water to enter and be stored for high demand use times. These well systems are normally completed with a sand screen, to filter out small sediment particles. Note: being similar to a dug well, Bored Wells are also close to the surface, and rely on rain precipitation to keep them functional. As well, these wells are very susceptible to ground water contamination, but are less likely to be susceptible to potential freezing in lower temperature areas. It is also highly recommended to conserve water in the dryer months of the year, and have an Ultra Violet Water Treatment System, Carbon Filter/Fine Particle Micron Filter and or possibly a Water Softener System Installed. If your area has long, dry months of the year, a Bored Well system is not usually recommended. Drilled Wells. Most commonly drilled by a 8" auger bit, these types of wells are designed to penetrate approx 80-400 ft beneath the earth's surface, into bedrock. The well is drilled to a suitable depth, so that the well intersects fractures within the bedrock, allowing ground water to pass through the screen and into the well. By extending the well into the bedrock, it also reduces the possibility of surface water/contamination from entering the well. A drilled well casing is typically constructed using plastic or metal pipe, which could be a variety's of widths; most commonly are 6 inch and 8 inch. The drilled well casing is designed to travel the entire length of the well, and a minimum of 5 feet drilled into bedrock; this will prevent the ground water from penetrating into the well. The portion of the casing above the ground surface should extend a minimum of 12 inches and the casing lid properly secured; to prevent the possibility of anything being dropped or poured into the well casing, causing possible contamination of the drinking water. To prevent moving of the casing, air escape or contamination from surface water, a grout/cement sealant or bentonite clay is also recommended to be applied/poured around the outside of the well casing. The most common types of pumps used with a Drilled Well are a Submersible Pump, and or a Convertible Jet Pump. These pumps are designed specifically to lift water from a deep distance and to generate a high water volume. Keep in mind that working with wells and pumps is a very technical job, therefore it is recommended to hire a well driller and plumber when attempting to install or do repairs. More information on water pumps can be found by clicking here. 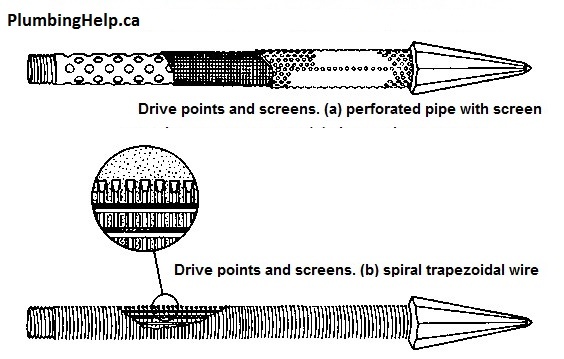 The following is a diagram of a typical Drilled Well, showing all parts of a well and ideal design plan. As well, in areas where the well water is susceptible to freezing conditions, the supply line from the well must be dug deep enough to be below the frost line for your area. Click here to find out the frost level line depth for your area. Driven Well. 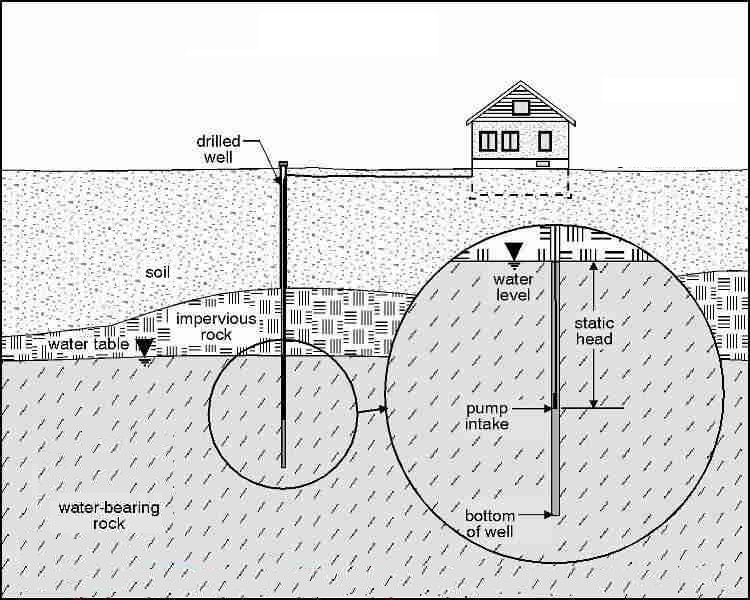 These types of wells are used mainly in areas with a high water table, with sandy, and or loose permeable soil. Soil with rocks and or other obstructions will prevent the Sandpoint Well from being driven into the soil; this will damage the well point, and also prevent you from pulling the well head back out, to try a second re-entry. They are driven into the soil by means of a sledge hammer or specialized device designed to drive the well; it is extremely important to try to keep the well as level as possible while it is being driven deeper into the soil. Although the Driven well is a very inexpensive alternative to other wells, keep in mind that they are very susceptible to surface water contamination, and can be very easy to damaged during the installation process. Driven wells are shallow wells, in that they must be less than 30 ft deep. 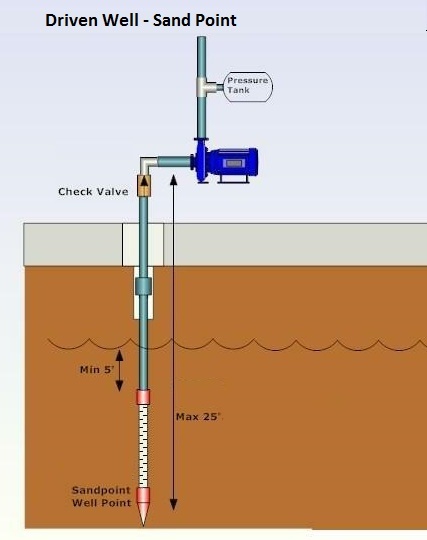 An electric shallow well pump or manual hand pump configuration can be installed to lift the water to the surface. If the driven well is to be used for drinking water, it is also recommended to have a filtration system installed to reduce or prevent the risk of contamination. To prevent moving of the casing, air escape or contamination from surface water, a grout/cement sealant is also recommended to be applied/poured around the outside of the well casing. Note: due to gravity and the weight of water, if the sandpoint well was driven deeper than 30 feet, it would be impossible to pull water to the surface. The ideal depth of a driven/sandpoint well is 25 feet below the surface. The reasons for this is covered in our Types of Pumps article.